Sandeman, J. (2014, August 12). Online comments cause SU Tasmania Chaplain Troy Williams to be sacked. Bible Society.org.au. Retrieved from http://www.biblesociety.org.au/news/online-comments-cause-su-tasmania-chaplain-troy-williams-sacked. Day, L. (2014, August 7). Hobart College chaplain apologises for homophobic Facebook post. ABC.net.au. 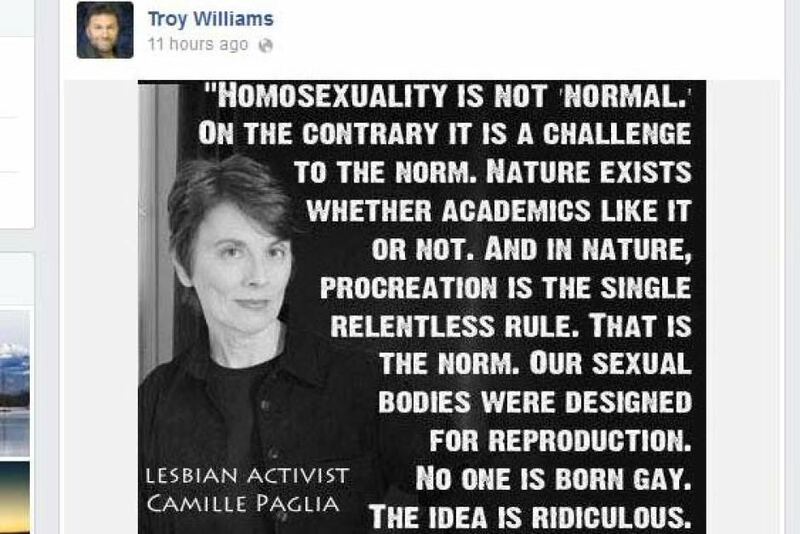 Retrieved from http://www.abc.net.au/news/2014-08-05/school-chaplain-posts-homophobic-comment-on-facebook/5650640. Muehlenberg, B. (2014, August 5). When the Pink Mafia Are In Control. CultureWatch. Retrieved from http://billmuehlenberg.com/2014/08/05/when-the-pink-mafia-are-in-control. Shine, T. (2014, August 8). School chaplain sacked over Facebook post calling homosexuality ‘not normal’. ABC.net.au. Retrieved from http://www.abc.net.au/news/2014-08-08/hobart-college-chaplain-sacked-over-homophobic-facebook-post/5657750.